BLOOMINGTON, Ind. -- Astroturfers, Twitter-bombers and smear campaigners need beware this election season as a group of leading Indiana University information and computer scientists today unleashed Truthy.indiana.edu, a sophisticated new Twitter-based research tool that combines data mining, social network analysis and crowdsourcing to uncover deceptive tactics and misinformation leading up to the Nov. 2 elections. 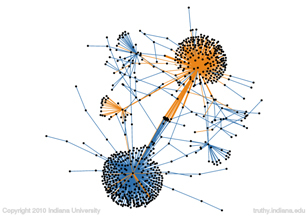 Pictured here is a diffusion network created by Truthy.indiana.edu for the Twitter burst generated by Lady Gaga supporters toward John McCain following Gaga's comments about McCain's opposition to repealing Don't Ask, Don't Tell. The meme was tweeted 1,276 times by 1,100 users, with 168 users retweeting 696 times and another 59 users mentioning the meme 325 times. Links in orange are mentions; blue links show retweets. "When we identify a trend we go back and examine how it was started, where the main injection points were, and any associated memes," said Filippo Menczer, an associate professor of computer science and informatics. "When we drill down we'll be able to see statistics and visualizations relating to tweets that mention the meme and basically reconstruct its history." 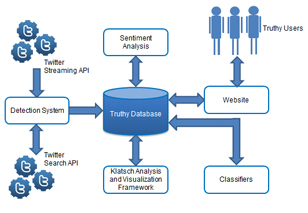 Streaming Twitter data acquired in real-time is matched against keywords to exclude tweets unlikely to contain political discussion and extract memes (mentions, hash tags, and urls). Memes of interest are isolated by considering only those that have just undergone significant changes in volume, or those that account for a significant portion of the total volume. Memes are then inserted in a database and Twitter API is used to obtain more information on each. Menczer explained that because search engines now include Twitter trends in search results, an astroturfing campaign -- where the concerted efforts of special interests are disguised as a spontaneous grassroots movement -- that includes Twitter bombs can jack up how high a result shows up on Google even if the information is false. As information scientists, the group is interested in understanding meme diffusion from various perspectives: Menczer, associate director of IU's Center for Complex Networks and Systems Research, focuses on data mining and meme burst modeling; Rudy Professor of Informatics Alessandro Vespignani's work relates to epidemic and contagion modeling; Associate Professor of Informatics Alessandro Flammini, also director of IU's Complex Systems Program, conducts complex network analysis, especially related to online text and social media; and Johan Bollen, associate professor of informatics and computing, has a background in cognitive science and specializes in sentiment and mood analysis from online text. To speak with Menczer or other members of the Truthy development team, please contact Steve Chaplin, University Communications, at 812-856-1896 or stjchap@indiana.edu.